The exhibition design by studio AR.CH.IT Luca Cipelletti presents the work of the painter Alberto Savinio by constructing an itinerary that offers a new reading of the recurrent themes in his work. In translating these themes into the formal strategies of the design, the exhibition becomes a spectacle that engages the visitor. 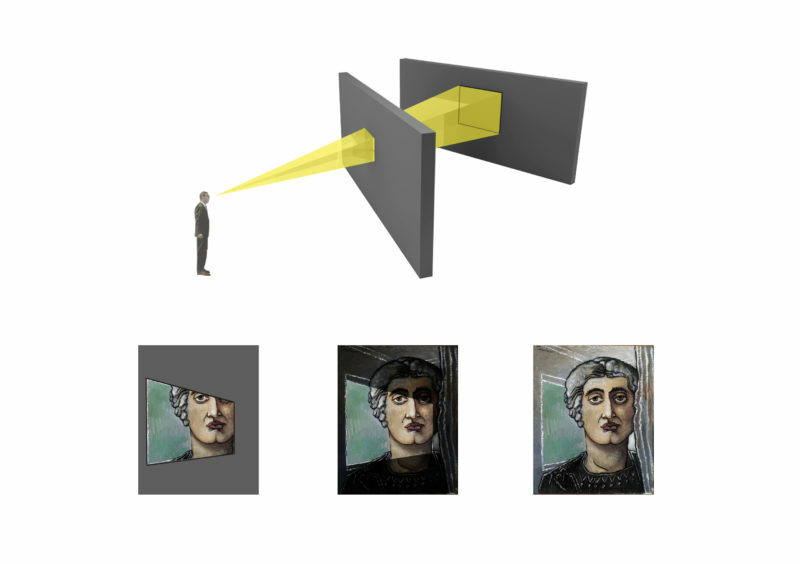 Since the themes of the projective “window” and of the act of “seeing through”, underscored by the use of perspectival distortions achieved through a rotation of the optical pyramid, are characteristic of Savinio’s repertoire, the formal strategies in each room employ these devices with the aim of creating a unique and dramatic experience. As a result, the exhibition design solutions vary both in accordance with the specific characteristics of each work and the succession of perspectives that open between one work and another. With the aim of creating continuous shifts in point of view and precise alignments along the exhibition path the arrangement of the different parts of the show follows a sequence that avoids the normal itinerary dictated by the plan of the Palazzo Reale. All of the rooms in the Palazzo have been given a wall system 3 meters thick with an orientation that differs from that of the Palazzo. A rotated system in the “visitor’s box” determines the narrative flow and introduces the viewer to Savinio’s artistic world. Windows and portals punctuate these walls so as to visually and spatially frame each work. The works are positioned in the background of the room, allowing them to stand out and speak to the visitor. This approach enhances their singularity and power of fascination. If in this way a mode of display has been adopted that interprets Savinio’s artistic vision by engaging the visual logic of his perspectival devices and distortions, it is also the case that the main emphasis is placed on the works themselves. As far as the lighting is concerned, this approach presupposes the use of spotlights on the works and downlights for the texts and the captions. Attention is thereby focused on the works, whether they are placed on the walls of the Palazzo or on the surfaces of the exhibition apparatus. The end result is a constructed world in which the objects on display and the visitors become the protagonists. The environment can also be described as a scenographic backdrop where people and works of art can enter into direct contact. Ultimately what is at stake is the production of a system that accompanies the visitor through the entire itinerary, avoiding the monotony that often mars the museological experience by offering a direct relationship with the artist’s mode of thought – what might be called, if one wishes, his “philosophy”- and the world that he created.